Hey, hey its Wednesday!! Guess what? It is official, I have booked my hotel room for NYFW. Now the real worry in my life, what to wear?! It’s so hard for me to make any type of decision. I am literally the most indecisive person in the world. No matter what the occasion is, I usualy change an average of five (maybe 10) times. If anyone has any suggestions, send them my way! Enough about NYFW for now! EEEEKKK I’m so excited. I have been looking for a bomber jacket for at least a year now. When I saw this pretty lavender quilted bomber from forever21, well my heart skipped a beat. I knew it was love at first sight. This color was different for me and would be perfect for transtitoning into spring. 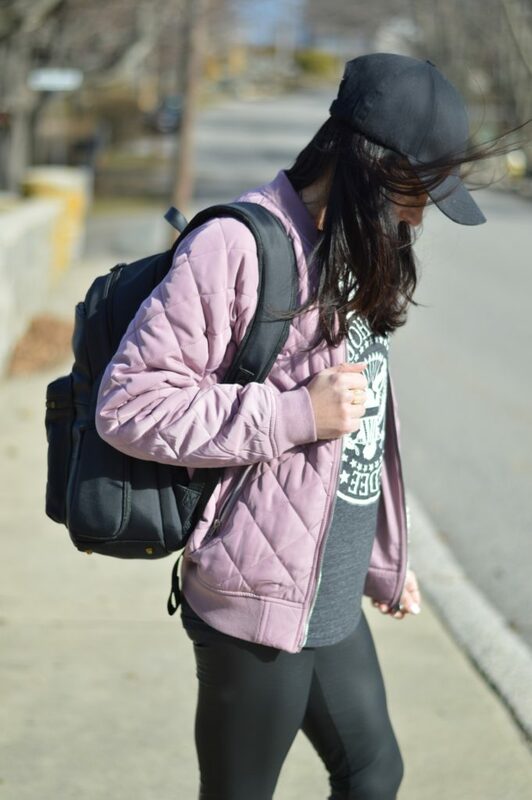 These jackets are perfect for the athleisure look that I am loving at the moment. Who else is loving that leggings and sneakers are now on trend. I love incorporating band tees into my look, they are so comfortable and can be styled up or down. You could totally make this look perfect for girls night out with some lace up heels, and a blazer! Did you happen to see this gorgeous leather backpack?? It’s not only cute, but it is also functional. This backpack by Jill-E designs has a joey charger where I am able to charge my phone or laptop inside. It is perfect for my trip to NYC. Jill-E designs creates bags that fit all the devices we can’t live without these days. They have the perfect camera bag that will definetly be going on my birthday wishlist! 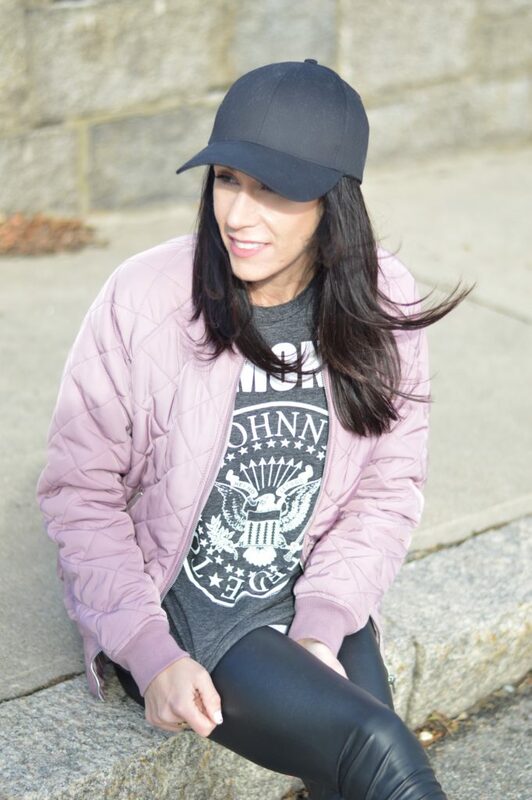 This bomber is selling out fast and also comes in green, So get on it!